Movie Night was born from the need to further take learning out of the classroom and engage the students by showing them real-life practical applications associated with the concepts and theories of technology. Although our auditorium has a standard sound system, that is not quite enough to truly enjoy a movie. 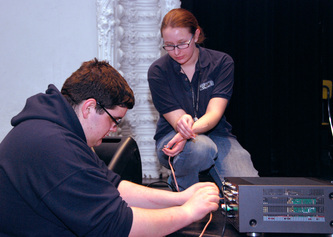 The Tech Club members are responsible for setup and tear-down of a sophisticated Dolby Digital 5.1 Theater Surround Sound System that must be moved into the auditorium from storage. This system is capable of delivering the type of sound that you can actually feel, and it is obviously the biggest reason why the Tech Club members enjoy movie night so much. Movie Night also offer a few other benefits. It would be enough for our club to have these nights just to ourselves, but it is important to us that more attention is brought to technology education. While not a fund raiser, donations collected at the movie night go to support the Tech Club’s many other activities such as our Audio/Video production team, Drama Tech, and our biggest event the Tennis Ball Cannon Competition. Movie nights also fill the need for a safe and local source of entertainment, while bringing the community into our the schools.